I love Sister Act. I love the story of one woman’s life transformed as she learns discipline, quiet and service, while the lives of those she lives among are similarly transformed as they learn creativity, teamwork and joyful expression. I’m also a sucker for a good singalong, and the re-vamped hymns certainly allow for that. 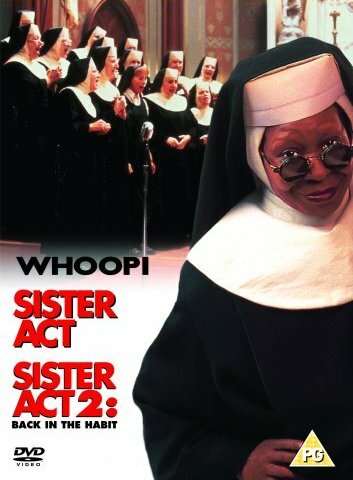 Sister Act II is also, unusually for a sequel, well worth watching. In it, Dolores and her fellow nuns take a bunch of disenchanted, disenfranchised, failing high school students and turn them into engaged, caring, hopeful successes. And it’s all through the power of music. But these stories are just fiction. Although they can catch me up in their emotion, and maybe even bring the occasional tear to my eye or shout of joy to my lips, I know they’re not real. A music teacher can’t really make that much difference in a child’s life. Can she? There are plenty of other films out there – based on true stories – which seem to suggest she (or he) can. I wrote about one of them last year. The teacher profiled in Freedom Writers taught English, not music, but the effect was the same; kids who everyone else had written off as failures became successful beyond their wildest imaginings because of the work of one teacher. At first, I entitled this post ‘Born for creativity’ because I thought it was the fact that these teenagers had been taught and encouraged to be creative that had released them from the failure they felt in an otherwise academically-focussed society. As I looked up some other films, though, I stumbled across several in which sport was the key which released the trapped potential. From violins to basketballs, the tools seem not to be so important as the technique; the common thread, it seems, is the impartation of hope. Somehow these children had never before come across someone who believed in them and had hope for their futures. Last night (Tues) I caught the end of a TV programme in which a ‘Fairy Job-mother’ helped 5 long-term unemployed people find the confidence and skills within themselves to go out and find work. She gave each of them the precious gift of hope. Today someone sent me this link to a video about a photography project in New York. Again, someone with a passion has decided to teach their skills to people who are desperately needy. The interviews with the young people are so moving as they describe going from a place of never thinking they could have anything to offer to being wanted, sought after, and having a marketable skill. Their photos are outstanding, and brimming over with hope. So yet more pressure on children to achieve academic success, and more pressure on teachers to push children to meet targets and pass exams, rather than discovering what they are good at and releasing and equipping them to flourish and find their place in the world. Yes, it’s important for everyone to be able to read, write and have some basic mathematical skills, but does every child really need to be weighted down with the burden of useless knowledge? It breaks my heart to see see the light in these young people’s eyes and know it is there for the first time ever. I can’t bear to hear politicians cracking their whips over the backs of struggling teachers and students because our grades need to be as high as those in other developed countries. We far too often value league tables over lives, and appearances over real achievement. It seems like a vast, insoluble problem, but if these teachers can do it, maybe, just maybe, there is hope. Great article Jennie. I’m also a sucker for those “Against all odds” movies and I totally agree that people need to be encouraged more to discover and pursue their talents and interests. Whilst I was in my second and final year at art college the tutor told us of a local design company that was looking for a junior and asked if any of us wanted to apply. I was the only one that showed interest but the tutor decided it would be good experience for all of us to apply! However, despite us all applying I was fortunate enough to be offered the job. When I told my tutor that I had the job and would be leaving college she was disappointed and said I should complete my education and then go on to university! I said I didn’t want to do university and that in the design industry experience was more important than qualifications. I was surprised that they arranged the interview but didn’t want any of us to actually take the job! Anyway I accepted the job against their advice and it was the best thing I ever did. When I was 21 my old college friends where coming out of uni desperate for work and I was still at the same company having got over 3 years experience. I now own a successful design company which isn’t bad for a college drop out!! 1. And now it is announced that 200 primary schools are to be made acadamies because they are failing. The pressure on children starts very young. 2. All people who take their own lives have one thing in common; they have no hope for their future. 3. Employers need to be re-educated to learn how to recruit the people who are right for their job instead of people who have the paper qualifications. Too many very able people are barred from applying because they do not have this or that bit of paper. That seems to me to be discrimination and contrary to any realistic concept of equal opportunities. Amen to all of the above. Very true and very sad. Especially when so many employers got their start in the years before everyone had to get 11 A*s at GCSE, then 5 or more A levels, then a degree, then a Masters. They walked out of school, into a job and worked their way up, learning the ropes as they went.